A newborn baby presented with respiratory distress, cyanosis and shock within 2 hours of birth. The cardiac evaluation showed supracardiac total anomalous pulmonary venous return with critically obstructed vertical vein. The baby underwent successful stenting of the vertical vein at 12 hours of life. Respiratory distress soon after birth is generally due to conditions like hyaline membrane disease (HMD), meconium aspiration syndrome (MAS), primary pulmonary hypertension of newborn (PPHN), pneumothorax, etc. Congenital heart defects causing respiratory distress include obstructed total anomalous pulmonary venous return (TAPVR) or systemic outflow obstruction. Clinical recognition of obstructed TAPVR soon after birth is quite challenging, and the treatment generally needs stabilization and immediate surgical correction. Stenting of the vertical vein in obstructed TAPVR is not a well-established procedure; however, anecdotal case reports ,, have shown better outcome. We report a neonate who presented with respiratory distress, shock and underwent successful stenting of the obstructed ascending vertical vein. A term 3-kg-baby girl born by Cesarean section had severe respiratory distress, cyanosis and shock immediately after birth. APGAR was six at 1 minute and eight at 5 minutes. The initial evaluation showed cyanosis, poor perfusion and heart rate of 160/min. Examination of the cardiovascular system did not reveal any significant findings. The chest roentgenogram showed pneumothorax on the left side and uniform reticular pattern on the right side [Figure 1]. The ABG showed pH of 7.27, PO 2 of 22 mmHg, PCO 2 of 29 mmHg, saturation of 60% and base excess of - 12 mEq/L. The left pneumothorax was drained with an 18-G needle; however, baby did not improve and continued to have significant desaturation. Hence, an emergency echocardiogram was obtained which showed normal situs, normal atrioventricular-ventriculoarterial concordance. There was increased flow in the right superior vena cava. All pulmonary veins formed a small confluence from which an ascending vertical vein was seen draining into left innominate vein. The color flow mapping of vertical vein showed long segment of critical obstruction with a threadlike lumen. There was a 5-mm interatrial communication and a 4-mm arterial duct with right-to-left shunt. The baby was ventilated in view of clinical deterioration and refractory hypoxemia. A few hours later, baby became unstable and developed cardiac arrest twice which was successfully managed. Cardiac catheterization with intention of stenting of vertical vein was planned at 12 hours of life in view of unstable hemodynamics. The cine angiogram showed supracardiac TAPVR with critical obstruction of left vertical vein and small confluence [Figure 2]a. The obstructed left vertical vein was crossed with a 0.014" Galeo extra support wire (Biotronics, Germany), using a 5F Judkins right coronary guiding catheter (Cordis, USA). A 4 × 28 mm ProLink stent (Vascular Concepts Limited, India) was positioned and deployed under fluoroscopy guidance. An additional 4 × 10 mm ProLink stent was deployed to cover the small residual stenosis. Post-procedure angiogram showed establishment of good communication between the pulmonary venous confluence and the left innominate vein [Figure 2]b. The postprocedure ABG showed PO 2 of 44 mmHg and saturation of 76%. The pulmonary artery pressure could not be obtained due to unstable hemodynamics. A transumblical balloon atrial septostomy was performed on day three in view of restrictive interatrial communication. The repeat chest roentgenogram showed some degree of reduction of pulmonary venous congestion and increased pulmonary vascularity [Figure 3]. Serial echocardiograms showed good stent flow. The shunt across the arterial duct became left-to-right. The baby developed features suggestive of sepsis and blood culture showed growth of Gram-negative bacteria; hence surgery was rescheduled till the completion of antibiotics. Extubation was attempted twice, on day 7 and day 10, but was failed. The baby had severe sepsis and succumbed at the end of the third week. 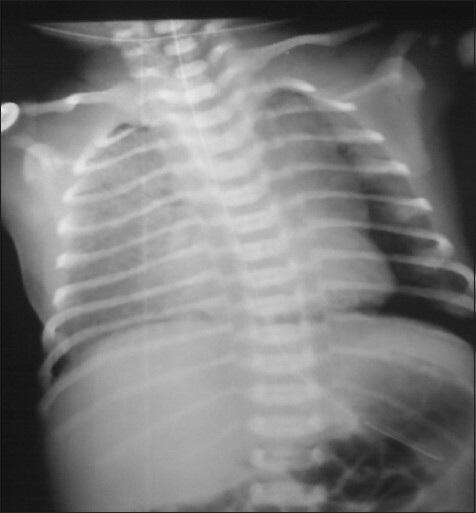 Obstructed TAPVR is an important differential diagnosis of respiratory distress in a newborn. However, the presentation soon after birth is uncommon. A high degree of clinical suspicion and evidence of pulmonary venous hypertension on chest roentgenogram will necessitate the evaluation by echocardiogram. In our patient, the chest roentgenogram showed pulmonary venous hypertension and left pneumothorax [Figure 1]. Worsening of clinical status in spite of adequate left lung expansion led us to suspect cardiac condition. Sharda et al.,  has reported that spontaneous pneumothorax is associated with common pulmonary vein (CPV) atresia. The angiogram of our patient showed critically obstructed vertical vein with a thread like lumen that hemodynamically mimicked atresia of the CPV [Figure 2]a. Emergency surgical correction was not considered in our case because of inadequate information of the cardiac anomaly and secondly, due to multiple cardiac arrests. Moreover, the small pulmonary veins due to obstructed TAPVR are difficult to rehabilitate. Meadows J et al.,  has reported the use of ECMO for preoperative stabilization in obstructive TAPVR; however; it is not a well-established procedure. Few case reports have shown stabilization of the sick cardiac neonate with obstructed TAPVR by endovascular stenting. , In our patient the vertical vein was critically obstructed mimicking CPV atresia leading to shock and pulmonary edema, resulting in unresponsiveness to conventional management with ventilation. Transcatheter stenting was felt to be the only option. The baby's clinical condition and the chest roentgenogram [Figure 3] showed dramatic improvement after the stenting of vertical vein. Our case is unique because of its early presentation and critical hemodynamic instability leading to multiple cardiac arrests which was stabilized with stenting of vertical vein. Unfortunately, baby succumbed due to comorbid conditions. This report highlights the feasibility and effectiveness of transcatheter stenting of the vertical vein for obstructed TAPVR as an emergency measure to stabilize a sick neonate. This palliative procedure can act as a bridge to surgical repair that can be performed on a more stable patient. 1. Whitsett JA, Rice WR, Barbara B. Warner. Acute respiratory disorders. In: MacDonald MG, editor. Avery's Neonatology: Pathophysiology and Management of the Newborn. 6 th ed. New York: Lippincott; 2005. p. 554. 2. Sasidharan P. An approach to diagnosis and management of cyanosis and tachypnea in term infants. Pediatr Clin North Am 2004;51:999-1021, ix. 3. Ramakrishnan S, Kothari SS. Preoperative balloon dilatation of obstructed total anomalous pulmonary venous connection in a neonate. Catheter Cardiovasc Interv 2004;61:128-30. 4. Kilgore A, Lucas V, Collins T, Snyder CS. Stent implantation as a stabilization technique in supracardiac total anomalous pulmonary venous connection. Catheter Cardiovasc Interv 2006;68:629-31. 5. Kyser JP, Bengur AR, Siwik ES. Preoperative palliation of newborn obstructed total anomalous pulmonary venous connection by endovascular stent placement. Catheter Cardiovasc Interv 2006;67:473-6. 6. Sharda JK, Kurlandsky LE, Lacina SJ, Radecki LL. 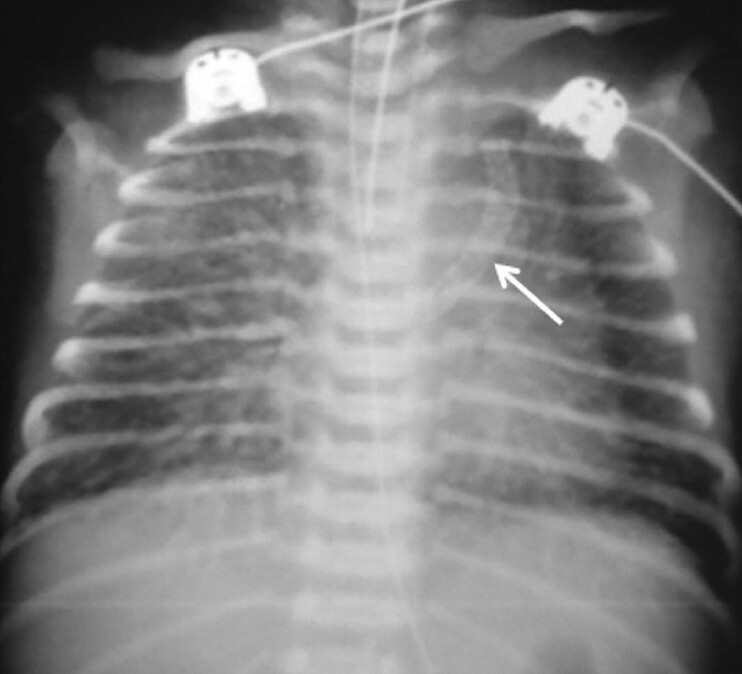 Spontaneous pneumothorax in common pulmonary vein atresia. J Perinatol 1990;10:70-4. 7. Seale AN, Uemura H, Webber SA, Partridge J, Roughton M, Ho SY, et al. Total anomalous pulmonary venous connection: Morphology and outcome from an international population-based study. Circulation 2010;122:2718-26. 8. Meadows J, Marshall AC, Lock JE, Scheurer M, Laussen PC, Bacha EA. A hybrid approach to stabilization and repair of obstructed total anomalous pulmonary venous connection in a critically ill newborn infant. J Thorac Cardiovasc Surg 2006;131:e1-2.